-The fresh ripe pulp of the higher quality cultivars, and the “sherbet” made from it, are taken for their mild laxative, tonic and digestive effects. -A decoction of the unripe fruit, with fennel and ginger, is prescribed in cases of hemorrhoids. -Pulp of the fruit (which is rich in Psoralen) increases tolerance to sunlight and aids in the maintaining of normal skin color. It is employed in the treatment of leucoderma. -The bitter, pungent leaf juice, mixed with honey, is given in cases of a fever. With black pepper added, it is taken to relieve jaundice and constipation accompanied by edema. -The leaf decoction is said to alleviate asthma. -A hot poultice of the leaves is considered an effective treatment for ophthahnia and various inflammations, also febrile delirium and acute bronchitis. -A decoction of the flowers is used as eye lotion and given as an antiemetic. -The bark decoction is administered in cases of malaria. -Decoctions of the root are taken to relieve palpitation of the heart, indigestion and bowel inflammations; also to overcome vomiting. 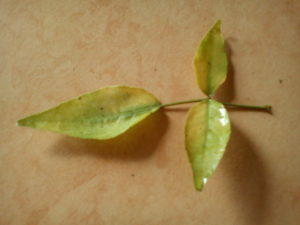 -The root leaves and bark are used in treating snakebite. – In case ofAbdominal discomfort, Boil together 50 g bark of Bael, 25 g flower of caraway, 25 g of dried ginger and take the decoction twice daily in empty stomach for two to three days. -To treat acidity Acidity, grind together the leaves of Bael and black pepper with water and Take this paste orally once only. -In complaints of Burning sensation while urinating, Grind together the leaves of Bael and durva (Cynodon dactylon) with little water and take this paste in the morning with a glass of water on an empty stomach once a day for 15 day. -For relief from Constipation, make a drink (sherbet) of the fruit’s pulp with sugar and consume it orally early in the morning once a day till it cures. Conversely, grind roots of the Bael plant with cold water and make a paste. Take the paste orally on an empty stomach once a day early in the morning till the constipation is relieved. -Diarrhea is treated by a decoction made by boiling the bark of Bael in water. Filter this and add some powdered long pepper to it. Take the decoction twice daily for two to three days. -To treat a Fever, Boil leaves of Bael in water, filter and take the decoction orally twice daily for two days. (Or) Boil the bark of Bael in water and filter it. Add a little juice of garlic to this decoction. Take this orally twice daily for two days. -In case of Indigestion, grind the leaves of Bael with black pepper. Take this orally twice or thrice for one day only. -Respiratory ailments (like wheezing, spasm or common cold) can be treated by using a medicated oil prepared by heating together Bael juice, sesame oil, black cumin and black pepper. The oil is then massaged on the scalp or chest. -Oil derived from Bael is used to treat ear pain and infection. A few drops are put into the ear, twice daily. -People who show signs of excess body heat (especially women) are often advised to have a drink made by boiling the pulp of the fruit in water. -Bael gives a feeling of satiety, hence people travelling used to consume Bael fruits and juice in the earlier era. -To treat anemia, have powdered bael fruit with milk. Countries of South East Asia (particularly India, Bangladesh and Sri Lanka) employ alternative systems of medicine, and not only allopathy and western medicine. The basis of treatment in all these systems is understanding the physiology, and healing without synthetic chemicals. -The different parts of Bael are used for various therapeutic purposes, such as for treatment of Asthma, Anaemia, Fractures, Healing of Wounds, Swollen Joints, High Blood Pressure, Jaundice, Diarrhea, and Brain Typhoid. -Bael (Aegle Marmelos/AM) is used as a medication in the Unani and Siddha systems of medicine. It is used as an astringent, for treatment of digestive complaints, to cure diarrhea and bacillary dysentery, Dyspepsia, chronic inflammations, asthma, hypoglycemia, and hepatitis. -In Homeopathic treatments it is largely used for conjunctivitis and styes, rhinitis, coccygodynia, nocturnal seminal emission with amorous dreams, chronic dysentery.